It took two weeks of violent fighting for the Afghan government and their foreign allied forces to take back Kunduz, Afghanistan’s fifth largest city, from the Taliban, who had captured it on September 28. But hundreds of miles away from Kunduz, the residents of Camp Jadeed, a makeshift Afghan refugees’ neighbourhood in Karachi off the Northern Bypass, are still worried over the news coming from different parts of the Kunduz province through Afghan TV channels watched there. “We keenly follow news of the fierce fighting between the Afghan forces and Taliban in Kunduz and updates on bomb blasts as some of our relatives went back there from Karachi a few months ago because of the increasing harassment at the hands of the law enforcement agencies in the city,” said Mustaqeem Jan, 55, who had arrived in Karachi from the Kunduz province in 1979. Afghan refugees and their representatives said most inhabitants of Camp Jadeed and Afghan Basti, located near Al-Asif Square on Super Highway, had arrived from different districts of the Kunduz province including Kunduz, Khan Abad and Chahar Darra. They are ethnically Pashtuns, Uzbeks, and Tajiks. Some of them are from the Sar-e-Pol and Baghlan provinces. After an attack on a school in Peshawar in December last year that killed over 130 students, the law enforcement agencies, especially police, launched a crackdown on Afghan refugees across the country, including Karachi, compelling many of them to return to their homeland, despite the harsh cold weather there at that time and security issues. Jan said his brother, Subhanullah, went to Kunduz city in March after police arrested him even though he had a Proof of Registration card issued by the National Database and Registration Authority that was valid till December 31. From January to March, police arrested dozens of refugees in different parts of the city every day and registered cases against only a few of them under the Foreign Registration Act. The rest were released after taking bribes ranging between Rs10,000 and Rs50,000. Haji Abdullah Bukhari, a representative of the Afghan refugees in the city, said the crackdown had pushed Afghan refugees to go back to their home provinces, especially Kunduz. “At that time, there was comparatively peace in Kunduz and refugees largely migrated there,” Bukhari added. Officials of the United Nation High Commissioner for Refugees (UNHCR) in Karachi said there was a rise in voluntarily repatriation of Afghan refugees from the country, including Karachi. 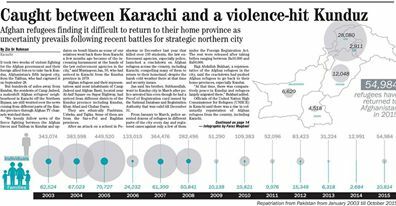 The UNCHR statistics show there are 62,500 registered Afghan refugees in Sindh and 85 percent of them live in union counil-4 and union council-5 of the defunct Gadap Town, which includes Camp Jadeed and Afghan Basti. From January to October 10, 10,814 families (54,984 individuals) have been repatriated from the country – 915 families (4,518 individuals) of them from Sindh. The UNCHR figures show that 2,684 families (12,991 individuals) and 6,318 families (31,224 individuals) were repatriated from the country in 2014 and 2013 respectively. However, Afghan elders and analysts pointed out that the recent crisis in Kunduz had negatively affected the repatriation process as the refugees who had arrived from the province were now unwilling to return because of the security situation there. “Pakistan’s law enforcement agencies have been harassing us so that we leave the country. But there are still security problems there as the Taliban are still in position to capture any Afghan city and start a fierce fighting with the Afghan government,” said Bukhari. The United Nation Office for the Coordination of Humanitarian Affairs (UNOCHA) has that estimated that around 13,000 families had escaped Kunduz city in the last two weeks. Jan’s brother is one among them. He fled to Kabul because of the fighting and is now searching for a home in Kabul to permanently live there. “My brother is finding it very hard to find a home in Kabul as it’s very expensive,” said Jan. He added that his brother had advised him and other relatives not to return to their home country. Besides, the refugees said those who had returned to Kunduz were now finding it difficult to come back to Pakistan because of its recently imposed restrictions.